Today on the Pampered Chef Facebook page was posted a super easy and really yummy looking summer recipe. You can't really go wrong with something that's three ingredients, no cook and could be used as a side, appetizer or a dessert! Since we already chopped up our big watermelon for the week I decided to adapt the recipe a little bit, for the original check out my Pampered Chef Facebook page. 1. Decide on what vessel you're going to serve watermelon in. I went for small individual bowls. 2. Top with crumbled feta and chives. The amount pictured below was definitely way more than I needed but if you're a salty cheese person the more the better right? For a little more flavor to the salad add a bit of your favorite balsamic vinager. Wow! This is an unusual combo! Was it awesome? 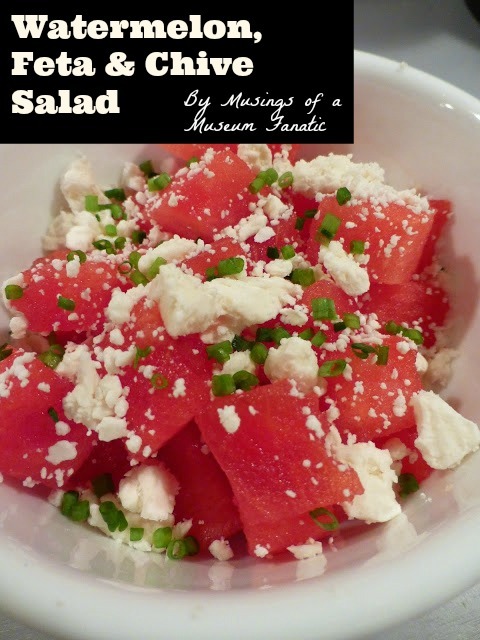 I enjoyed it, would have definitely used less feta or should have added more watermelon. A friend of mine suggested drizzling a little balsamic on it, I think I might try that version tonight! My mom likes the whole watermelon + feta, sweet stuff on salad thing. I hate it, my food has to be either salty like the feta or sweet like the watermelon. They cannot mix.